This dish is full of flavor and is a perfect soul warming meal for a cold winter night. 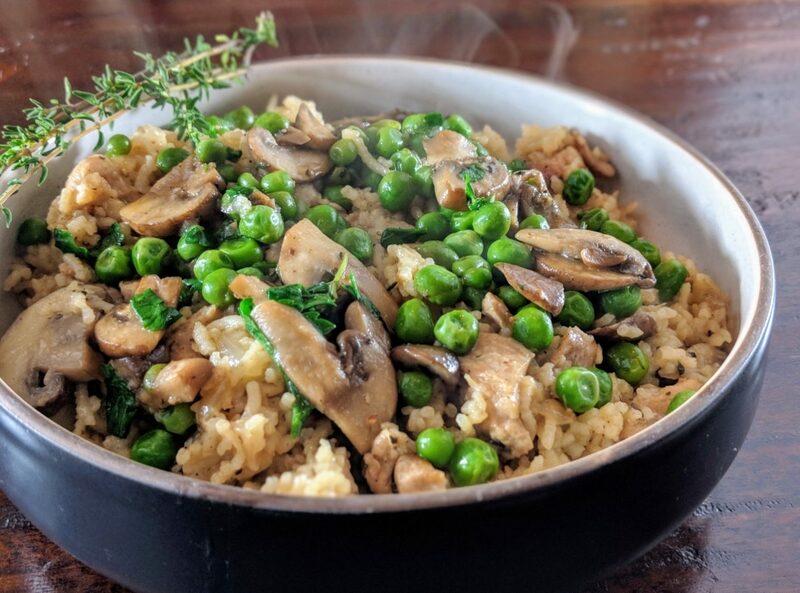 You can expect a great flavor pop from the peas and mushrooms and by adding them later in the process they maintain a great texture. The chicken and rice base is warm, filling and has great flavor from browning the chicken and all of the herbs. In this dish we are mixing two styles of cooking which creates a unique meal that is great for serving to guests or just a quick weeknight meal. Heat a dutch oven over high heat and melt the two tablespoons of butter. Place the chicken thighs in the dutch oven, salt and pepper the chicken and brown on each side without moving, about one minute per side. Take care not to over-crowd the dutch oven, brown the chicken in batches, if necessary. Remove chicken thighs and place aside. Once cooled enough to handle, chop into 2 inch pieces. While the chicken is cooling, turn the heat down to medium and add the onion to the pot. Saute until browned, about 5 minutes. Add the chicken back to the pot along with the thyme sprig and bay leaf and cook for 1 minute. Add the wine to the pot to deglaze the pan, making sure to scrape up any browned bits stuck to the bottom of the pot. Bring to a simmer for about two minutes. Add the rice and a handful of mushrooms to the dutch oven, stir to combine, and then add in the chicken stock. Bring to a simmer and cover the pot, cooking on the stovetop for 10 minutes. Preheat the oven to 350 degrees F. After the oven has preheated and the dish has cooked for 10 minutes on the stove, place the covered pot into the oven and cook for 20 minutes. Remove the dutch oven and place on the stove to rest for 10 minutes. While the dish is resting, prepare the herbed mushroom and pea garnish. Over high heat melt the 3 tablespoons of butter in a sauce or saute pan. Add the mushrooms, season to taste with salt and pepper, and cook for 5-7 minutes until softened and browned. Add the frozen peas to the mushrooms and saute for 1-2 minutes, until warmed through. Remove the pan from the heat and stir in the microplaned garlic, teaspoon of thyme, and parsley. Make sure to incorporate this fully into the the mushrooms and peas. Uncover the dutch oven and fluff the rice. Spoon into warmed bowls and top with the mushroom and pea garnish. Season to taste with additional salt and pepper and enjoy!